We are engaged in offering a comprehensive range of bottom hung windows which is manufactured using advanced technology machines. Our range is suitable for ventilation purposes in areas at a considerable height from the floor level. These are hungs are provided with a lever which can bring them down at a desirable height, to ensure easy operation. Tisya Building Products Pvt Ltd.
Relying on our expertise in this domain, we are into offering Single Top Hung Window. We are dedicatedly engaged in manufacturing and supplying high quality Single Hung Windows. Offered range of windows ensures the room to be airy and is extremely stylish in nature. Our entire product range is water-proof and is delivered in varied looks. 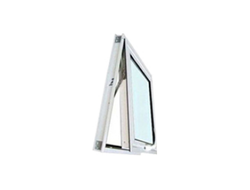 Being a client-centric organization, we are engaged in manufacturing Top Hung Window. Single Hung Windows / Doors : A Window which one Vertically sliding sash which by-passes the fixed upper sash in a single frame.